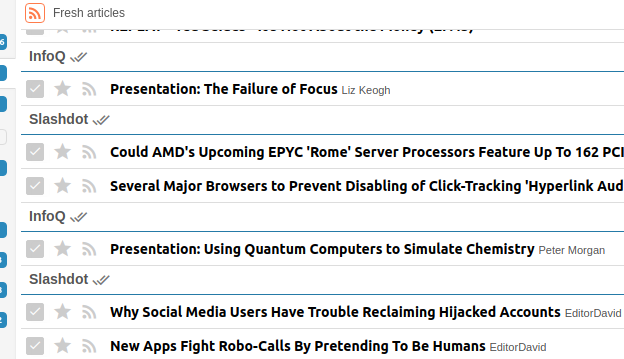 In the fresh articles view, Some of the feeds appear more than once. What could be the reason? When I click on the feed name, it takes me to the same feed. Feeds are not subscribed twice. that’s how grouping by feed works: articles are grouped within specific time interval (i think its a week) then goes to other feeds. if you don’t have a lot of articles it might cycle like your screenshot. That makes sense. I have configured fresh article to display last 72 hours. Probably it’s grouping the articles per day. Sounds reasonable. I have another question. It looks like the timezone of the grouping doesn’t reflect my timezone in the preferences. There’s an article from 1:16 for instance. Not a big deal for me but for you information. i’m not sure what gave you an idea that cutoff age of fresh feed affects this in any way. read my linked post, it goes by year - week number. tt-rss uses UTC internally. this grouping uses UTC import date. if you have other questions about timestamps, see the FAQ / search first.